It’s really excellent on what the important things are when running a large team or business. Andy Grove was co-founder and CEO of Intel, so it’s written by someone who was actually doing the work at the time, unlike lots of other management books. A lot of it really resonated with me because it reflected some of my own views, but it also changed my perspective on a few things; particularly the value of 1-1s and on how much time is reasonable to be spending in meetings. There is always more you could or should be doing, so the skill in being a manager is in shifting your attention to the activities which will have the most impact on increasing the output of your organisation. In other words, working out which activities are the ones where your leverage will be greatest. This is the highest impact thing you can do, because the more senior your reports are, the more they can take on big pieces of work that will free you up. This makes 1:1s with your reports one of the most important things you can spend your time on. He suggests the agenda for the 1:1 should be set by the report, but also says you should cover current problems, plans and what’s worrying them/what they see as future problems. Another suggestion he makes is that being part of a peer group is a way to increase your leverage by affecting the work of all. This one was counter-intuitive to me, but after six months of being involved in the Technical Leadership Group at the Financial Times, I can really see what he means by this. The output of a manager is a result of a group under her supervision or management, or as my excellent boss Cait O’Riordan puts it, “you’re nothing without your team”. He gives the example of a fire station. You have to shape an energetic team that can deal with whatever comes up. He points out that the “delegator” and the “delegatee” need to have a common set of operational ideas about how to go about solving problems, otherwise the delegatee can only become an effective proxy if given explicit instructions. Like with micro-managing, this really isn’t effective in multiplying your impact, or, as he puts it “meddling produces low managerial leverage”. following the corporate culture makes it easy for people to make decisions. If that common base of information and similar ways of doing and handling things is created, this can exert enormous leverage. He also has suggestions for how to effectively delegate; following the principles of quality assurance in manufacturing that he introduced early in the book, e.g. review rough drafts of reports and sample output (more often if they are unfamiliar with the task, and then ease off). The approach depends on the “task-relevant maturity” of the employee. Operational reviews and presentations are good source of motivation as people will want to make a good impression. “Monitoring” – giving people objectives and checking in – is on paper a manager’s most productive approach but we have to work our way up to it, and if things suddenly change we may have to revert quickly to much closer management of the task. But we are biased against that, so sometimes we don’t take it up where necessary until too late. We need to think about the most effective way to manage, not be guided by what we feel is good/bad. This one is really interesting, and he calls out that he disagrees with Peter Drucker on this. Drucker says that spending more than 25% of your time in meetings shows that “there is time-wasting malorganization”. Certainly, coming from an engineering background, I tend to feel the fewer the meetings, the better. But Andy Grove expressly disagrees with this. He points out that, as above, a big part of your role is to share know-how, and “impart a sense of the preferred method of handling things” to your reports. This can only really be done in person, and therefore, during meetings. “Thus I will assert again that a meeting is nothing less than the medium through which managerial work is performed”. So we shouldn’t be fighting their existence, but just making sure that we are using the time as efficiently as possible. This has really changed my perspective on a lot of the meetings I have. The most important thing in making good decisions is getting information; and usually this is better if verbal and quick, rather than written reports. It’s useful to go round and chat to people. Reports are mostly useful because they force people to clarify their thoughts, so the writing is more important than the reading. So make sure you schedule slack into your calendar. But you should also have a list of non-urgent things you can do that will increase productivity – otherwise you will use your free time to meddle in your reports’ work, which will slow things down. Hiding physically in order to get work done is not great, because people do have genuine questions or issues and you’ll slow things down. One approach is to standardise responses, which can then also help with delegation. Another is batching – if you have regular catch-ups people can’t complain about being asked to batch and bring to you at scheduled times. You could also have office hours. “To make something regular that was once irregular is a fundamental production principle and that’s how you should try to handle the interruptions that plague you”. He scrutinises a selection of performance reviews given by other managers to their reports throughout the year, with as much visibility as possible, to make it clear it’s the most important kind of task-relevant feedback we can give our reports. When delivering a performance review make sure your report receives the message. Don’t say too many things in a performance review as they may not take it in – focus on the most important things. He also has some good, practical advice on how to prepare for and run a performance review. The performance rating of a manager cannot be higher than what you would give the organisation under her control. If there is a problem and they don’t agree with your assessment but commit to your proposed solution, that’s fine. To make things work people don’t need to side with you, they only need to commit to pursue a course of action that’s been decided on. He also has some practical advice on how to get that commitment. He points out that often the reviews of star performers focus a lot on what they’ve done well, whereas reviews of poor performers focus on how they can improve, but in fact we should spend more time on focusing on how star performers can improve. It’s a high leverage activity because it will have a big impact on group output. If a valued employee wants to quit your top priority becomes that – not going to whatever important meeting you are on your way to. Your first reaction counts. The first stage of making decisions with a team needs to be free discussion. It’s very important that everyone feels they can contribute, because more junior people are likely to have a better grasp of the technology than senior managers, but senior people have experience from previous errors, etc. Once a decision is made it needs to be clear, and it needs to be supported by everyone, even those who don’t agree. Confidence in these discussions comes from realising it’s OK to make mistakes, so it’s important to make sure everyone understands this. That is, in this book written 35 years ago, he’s telling us about the importance of psychological safety. In manufacturing, it is vitally important to reject defective material at its lowest value (i.e. when you’ve not done much work on it). Similarly with managerial work. Say no as early as possible. Getting an unnecessary meeting called off early is the same as stopping work on something at a low value-added time. Remember: saying yes to one thing means saying no to another. And we can say no in two ways – one by saying no, and one by saying yes but not actually doing it. The latter wastes time and energy. The final thing I wanted to note was what he says about planning. If you see a gap today, that represents a failure of planning in the past, and if you focus your energy on fixing that, you are constantly chasing after things that should already have happened. You need to instead focus on future events. It was really hard to write this post because I made so many notes while reading it. When refreshing my memory of the book while drafting it, I wanted to make so many more, and this really just scratches the surface. It’s an excellent book and well worth your time reading it. This is an excellent book on web usability. If you have anything at all to do with producing websites and haven’t read it already, you absolutely must. This is a quite dense read but it’s extremely worth the effort. It explains how our minds trick us and what we can do to avoid making mistakes by biased thinking. 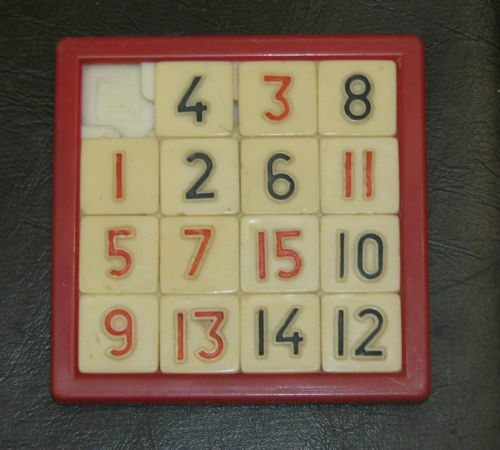 The example of a sliding tile puzzle. Without the empty slot, it’s a much more efficient use of space but you can’t actually do the puzzle. This has stuck with me a really powerful metaphor as to why we need slack at work. His explanation of why “people are not fungible resources”. If you have someone working half time on two teams, it’s not the case that they are 50% on each team and that adds up to 100%; it’s more like 30 or 40% on each team. The more teams you split people between, the less total time they’re able to actually function. For a better explanation of these two points alone, this is definitely worth the short time it will take you to read it. I’d be interested to hear about books that you recommend, or what you thought of these books if you’ve read them.